ACCELERATE PLANT GROWTH with FULL SPECTRUM: 8 red LEDs (620-625nm) helps plant photosynthesis, promotes growth, protein synthesis and fruit development. 6 blue LEDs (455-460nm), promotes rhizome growth, blossoming and bearing fruit, extending flowering phase and increasing output. 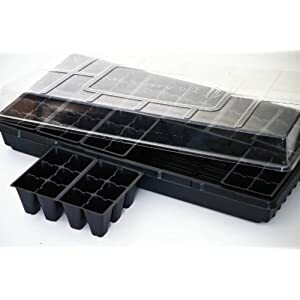 Ideal for starting seeds and growing indoor houseplants. Grow orchids, roses, peppers, tomatoes, herbs and leafy vegetables, lettuce, spinach, broccoli, medical marijuana and many other types of vegetables and fruits. FLEXIBLE GOOSENECK FOR MULTI-ANGLE ILLUMINATION: This growing light has flexible gooseneck that you are free to adjust the directions. Sturdy and compact stainless spring clamp design makes it convenient to use for indoor plants, the clamp range can be up to 2.75″inches, making it applicable to desk/flowerpot/grow tent etc. CONTROLLING DUAL HEAD SEPARATELY: The dual head can be turned on/off respectively. This unique design makes it possible for you to turn one lamp on, or both on depending on Plant and seed growth status. 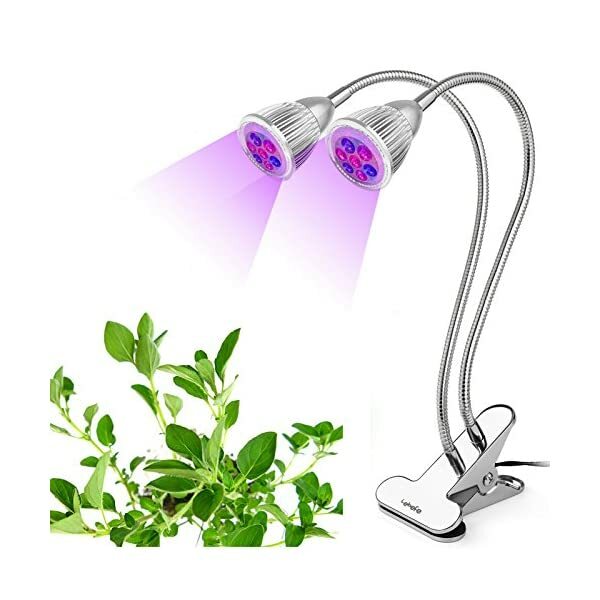 Why need to use Upgrade Version lebefe Dual Head 14W LED Plant Grow Light Lamp Bulbs? It nearly can grow any type of plants! One of the best responders include Tomato, Pepper, Basil, Lettuce, Violets, Orchids, Roses and so on. Food producing plants respond particularly well which lets you have fresh produce in your home all the year round at a low cost. 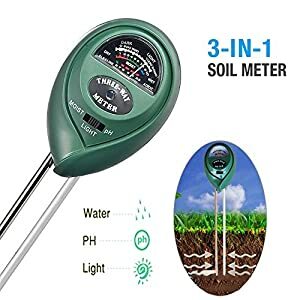 It can also be used in house garden, sowing, breeding, farm, flower exhibition, bonsai, green house, greenhouse cultivation, water soluble breeding, pipeline cultivation and so on. 8 red LEDs: 8pcs with wavelength 620-625nm, rich sources in red light are more efficient and beneficial for photosynthesis, best for flowering and seed production. 6 blue LEDs: 6pcs with wavelength of 455-460nm, blue light is more necessary for Chlorophyll and Carotenoid, good for the photosynthesis, best for promoting the stem and leaf. All kinds of flower plants: orchids, roses, peppers, tomatoes, etc. All kinds of greens: herbs and leafy vegetables, lettuce, spinach, broccoli, etc. 1. You’d better keep the plant more than 30cm (11.82″) away from the light source to prevent light burn. 2. Generally this grow light should be turned on for 5-8 hours each day. 3. 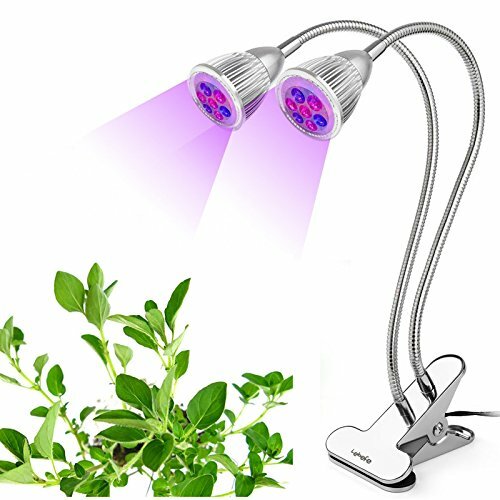 Understand that to keep enough water for the plants when you use this grow light. CONTROLLING DUAL HEAD SEPARATELY: The dual head can be turned on/off respectively. 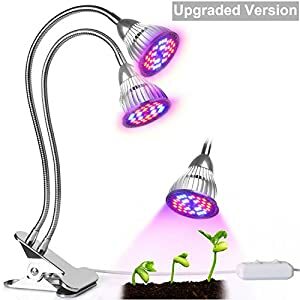 This unique design makes it imaginable for you to turn one lamp on, or both on depending on Plant and seed growth status. 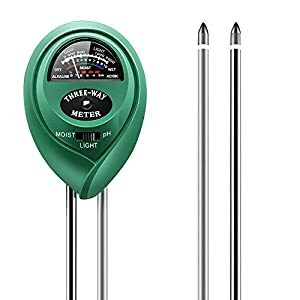 WIDE APPLICATION: Compact design, tight metal clip, can be placed anywhere you wish to have to put, easy to install in more than a few places, for indoors plants, Hydroponics, Greenhouse, Gardening, Office etc. Very convenient to operate. 100% MONEY BACK GUARANTEE: We’re so confident that you can love this LED grow light that it’s backed by our 100% Money Back Guarantee. If you don’t love it for whatever reason, we’ll replace it or refund all very soon after getting your feedback!